With a hinged handle design operated by a spring loaded mechanism, the Winco UT-9LT Coiled Spring Medium Weight Stainless Steel Utility Tong, 9" is a kitchen utensil that will have many uses at the grill or in the kitchen. 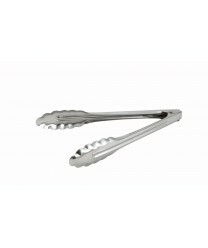 Featuring scalloped serving edges, these tongs can easily lift, grasp and rotate food on the grill, as well as be used to.sear foods on a pan. These stainless steel tongs can also be used on the serving line to serve hot foods, toss and serve salads and perform a myriad of other tasks, all at one economical price.